Which Ontario streams aren't too low to canoe during the summer months? Could you be a bit more specific, I'm sure there are thousands depending on your definition of a "stream" or "too low". There are about 250,000 lakes in Ontario and almost every one of them has an outflow and/or inflow stream. Yup---our local river here in wasaga is good all summer and we don't even have a lake to feed it! So much can depend on the weather and where you may be thinking of going. Many places last year suffered from early drought but then there was a wet August, and very wet Sept. Some places like Trent feeder systems can have releases, they just don't publish them. Eels Creek and the Mississauga are great runs when they have summer releases. River types can make a big difference also. 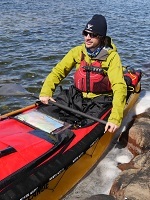 Make a list of what you may want to paddle and it will be easier to answer. What region are you preferring to paddle? 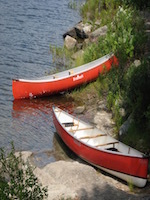 As mentioned there are thousand around the province and many can be paddled all year with a few lift-overs. Do you wish within City limits or Suburbs or camping options along the banks.. Narrowing your criteria and or locations would help immensely. I'm looking at streams flowing into Superior. Also some NW streams. Looking for wilderness, not simply rural. Natural flows, not damed. Well you are still going to have to narrow it down to some specifics. There are thousands of streams that match your location parameters, some can be paddled throughout the season and some can't. One way to get an idea is to study the topography, most smaller streams entering into Superior are steep, the steeper the stream the less likely it is to retain water through the season. The origin of the stream is also important, if it's fed by a fair sized lake or lakes it will be navigable more than one that starts in a small puddle or swampy area. I was looking at the Spanish River flowing into Huron, but I understand it's a spring run or nothing, even with the dammed source. The Spanish River has more water in it in April and May but still has enough to canoe the rest of the season . I have paddled it in every month from April through to October . Although I've never considered it a stream. A rough indicator of stream flow can be the watershed area drained by the stream, measured in square km.... the larger the watershed area, the greater the amount of rain and snow taken in and drained away by the stream and the greater the flow. Features in the watershed can affect how quickly the rain/snow drains off, with features favoring longer water retention allowing higher base flow during midsummer or dry spells.... deep vs shallow soils, forested vs cleared, elevation change, wetlands, lakes, dams, urbanized area. I can make this statement with some confidence since I'm a high school graduate and I clearly remember Mr. Pugsley, my Grade 12 geography teacher droning on and on and hemming and hawing about how topography affects the character of Ontario rivers. Most others in the classroom were put to sleep or maybe they were high on drugs. IIRC the Spanish is a dammed river and flow is controlled to a large extent by water releases... maybe a good thing for paddlers wanting less flashy drainage than in the natural situation where water drains off quickly. Flowing into the Great lakes? Or flowing north... even more options- Missinaibi, Groundhog, Ivanhoe, Nagagami, Albany... there's a ton. You can paddle all of these and more at any point in the open water season. If flows are low, you'll be doing more portaging or lining. However, if flows are high, you may be bypassing some gnarly whitewater. I'm not sure if I'd classify any of these as a stream though. If you're looking for a narrow, intimate river, some like the Obabika, Tim or Nipissing would likely fit the bill, but again, there are a ton more. Best to get a map, narrow down the area and ask. Seems like we need to clarify what is meant by "stream", most of the names mentioned so far I had ignored because I consider them to be rivers. To me a stream is something more akin to a creek, very small, seasonal and likely quite short. A river on the other hand flows year round although maybe not suitable for paddling at all times. As far as the Spanish, it's very rare for anyone to paddle downstream of Agnew Lake, upstream of Agnew it can be paddled pretty much anytime and because of the Bisco dam I've seen lower water early in the season and high water in July/August. One thing for sure, you probably wouldn't want to paddle the Puk except in the Spring. My state has no natural lakes. Dams on every STREAM (many of the creeks could be called rivers in other places). Most of the streams fed by these dams are tail draggers in the summer. Last time I ran into an exposed boulder field in August it was not what I would call navigable. Nor did I enjoy circumnavigating most of a river in Quetico once because it was so low it became a series of muddy portages not a flowing stream. Thanks for the info on the Spanish. My guidebook infers that there are issues with mid-summer runs. Technically speaking, both rivers and creeks are streams. The Steel can be run at any time, although later in August there may be a few spots where dragging is necessary. The Kapikotongwa can be run at any time as well. The Ogoki, Little Current and Drowning can all be run at any time. Great information. Thanks for the list. Hopefully, there will be an option I can access.